Our topic this term is 'Round and Round the Garden.' We will be learning all about the garden environment. we will learn to recognise minibeasts, remember their names, discover a range of flowers, plant seeds, grow vegetables and will observe life cycles aswell as lots more!! We have been trying very hard to spell tricky words. We had to look at the picture and write the word all by ourselves! We played in our new garden role play area too! We can get cosy and read lots of stories about the garden as well as lots of other exciting things! ENJOY YOUR HALF TERM HOLIDAY!! This week we tried very hard to remember or number bonds to 5 that we have been learning. 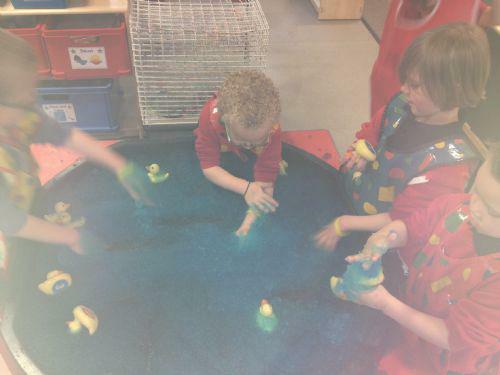 We pulled a rubber duck from the Jelly Bath and read the number underneath. We had to find the matching duck to make the number bond to 5. We also took home the cress that we have been growing. We must remember to water it over the holidays! We thought about what we could eat it with! Some of us decided on egg and cress sandwiches. This week we have been practising adding one more using function machines. We worked hard! To help us we learnt 'One potato, two potato...' here is the video so that you can sing it at home too! This week we having been learning how to 'add one more!' We tried very hard to form the numbers correctly. Look at us being maths wizards!! We also played on a maths game on the computer this week - it was fun! The ladies from the dentist came to visit Reception on Friday. They brought their special toothbrushes and painted fluoride onto our teeth to make them big and strong! We opened our mouths very wide and said ARGHHHH!! 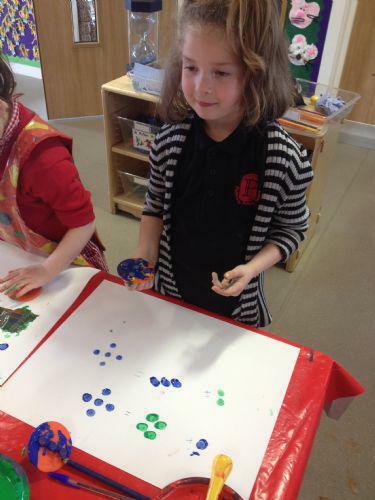 This week we have been practising making 5. We tried very hard to use stampers and make bonds to 5! 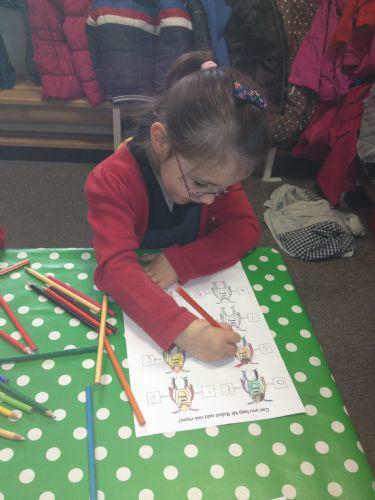 We are practising by doing lots of different activites to help us to remember them. It was very sunny this week too! Look at us having lots of fun outside! This week we looked at lots of different ways that we can move our bodies. Minibeasts move in lots of different ways. We tried to wiggle across the floor like a caterpillar. Miss Newell helped us by playing with hula-hoops, we tried very hard! We can really wiggle now! We also practised writing 'I can see a...' It was tricky but we used the word bank and we sounded out some of the words. 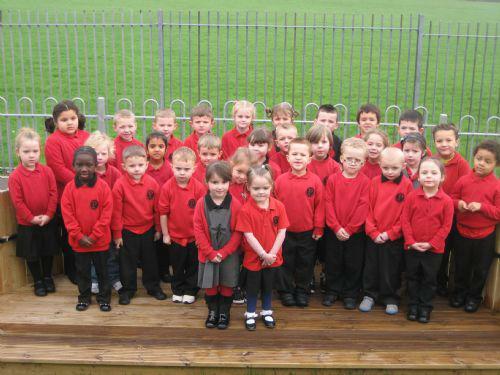 Mrs Rowles says we are "super-stars" at spelling! We used the foam stampers to practise spelling the words. This week we practised our spellings of lots of tricky words. 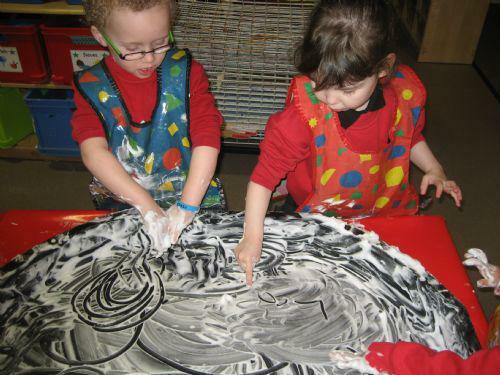 Mrs Rowles gave us a builder's tray full of shaving foam for us to practise in! We got very messy!! 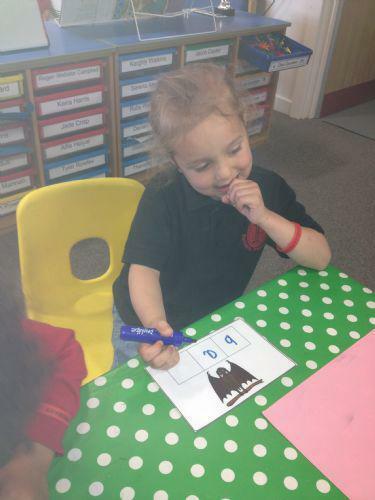 Look at the Alphablocks - they are learning to spell too! 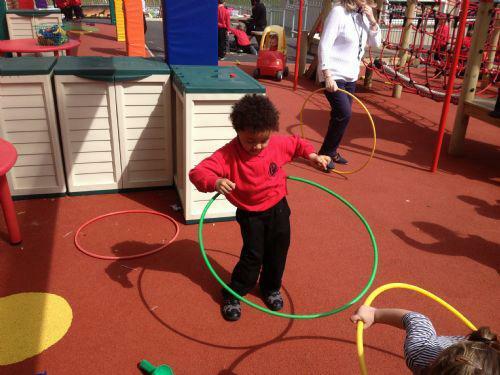 This week we talked about our new topic called 'Round and Round the Garden.' All the grown-ups helped us to make a mind map of what we already know so that we can learn lots of new and exciting things. We also practised our numbers this week. We sang 'The Number Rhumba.' - We love dancing! If there is anything you would like to discuss, please do not hesitate to ask any of the Early Years team. 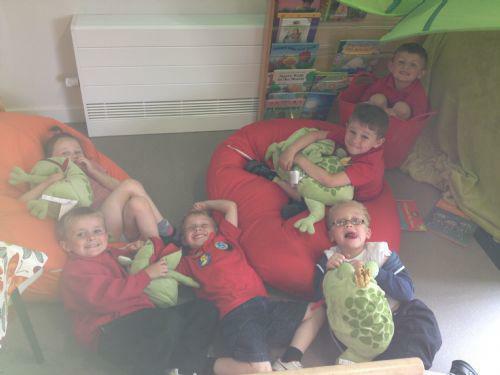 Dinosaurs Learn all about the different types of Dinosaurs.